Commit to an effective cross-training regimen whether you are a beginner or an elite athlete with the 2-in-1 Elliptical Trainer and Exercise Bike by Harvil. This indoor exercise bike is made of solid steel tubes with front and back stabilizers. The front base features built-in transport wheels for easy movement anywhere in your house or home gym. It has a maximum weight capacity of 250 pounds and runs on a chain-driven fan wheel. The Harvil elliptical bike also has a padded saddle seat on top of an adjustable seat post. It has textured, 13 x 6-inch long foot pedals which allow you to simulate cycling, stepping, skiing and walking with its fluid circular motion. It creates little to no strain on your back and knees. The foam-padded rail handles come in 2 types: the dual-action and the stationary rail handles for when you interchange between seated exercise bike or upright elliptical position. A tension adjustment knob keeps users in control of the level of difficulty to fit different workout needs. This elliptical exercise machine even has heart-rate sensors on the stationary handles and all important stats can be viewed on an 8 x 6-inch LCD screen that displays speed, time, distance and calories burned. Get this powerhouse 2-in-1 exercise bike from Dazadi now and get Free Shipping. 2-in-1 EXERCISE BIKE FOR TOTAL BODY FITNESS - This dual exercise machine is an interchangeable elliptical trainer and upright exercise bike. The easy-to-set tension adjustment knob increases or decreases resistance to accommodate any fitness level. Its ideal for beginners or elite athletes that aim for an effective upper and lower body workout. Maximum Weight Capacity: 250 pounds. ADJUSTABLE SEAT HEIGHT AND REVERSIBLE PEDAL MOVEMENT - Adjust the seat post from 31 to 36 inches to achieve correct posture every time while seated on the padded saddle seat. The 13 x 6-inch long and textured foot pedals allow reversible movement. Pedal forward to exercise your quadriceps and backward to target your hamstrings. Stride Length is 24 inches. EASY FITNESS STATISTIC TRACKING - Battery-operated LCD monitor displays speed, time, distance, calories burned, and heart/pulse rate to ensure that you are reaching your workout goals with every use. Runs on 2 AA batteries. 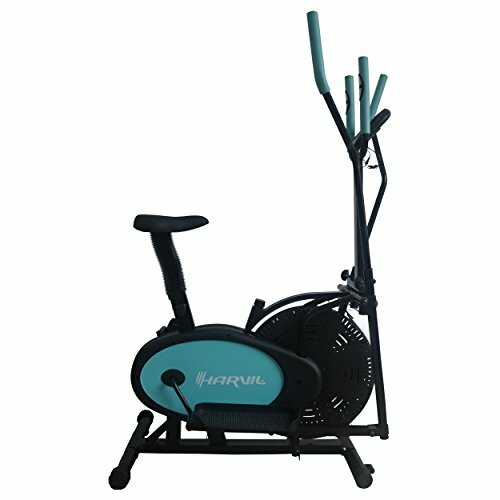 2 TYPES OF FOAM-PADDED HANDLES AND BUILT-IN TRANSPORT WHEEL - Choose between dual action workout rail handles that move along with the pedals when you execute your elliptical cross training or keep both hands on the stationary rail handles with heart rate sensors to use as an exercise bike. After your workout, just roll to storage the entire indoor exercise bike using the built-in transport wheel. DAZADI MONEY BACK GUARANTEE and WARRANTY - Items ship free to your door without defect and/or shipping damage or well replace it for free. We also offer in-home delivery and assembly for an added fee. Within the 90-day warranty period, we also repair and replace defective parts at no cost to the purchaser. If you still arent satisfied, youll get a full refund. Assembled Bike Dimensions: 35.5 L x 20 W x 57 H Inches/ Approximate Weight: 58.4 Pounds.